As the training year comes to an end, I would like to thank everyone for another successful, fun, dynamic, challenging training year. Parents, guardians and families, I thank you for allowing your youth to join and engage in Canada’s premier youth organization, the Royal Canadian Army Cadets. Sponsors, supporters, donors and communities, I thank you for investing into the development of our future community and Canadian leaders. Without your contributions and support, the mandate of the Army Cadet League of Canada would be much more difficult to achieve. Support Committees, volunteers, Army Cadet League of Canada Directors and Officers, I thank you for your selfless contributions to support the program at the local to national levels, and everything in between. Please know that your work is appreciated. Canadian Armed Forces members and leaders of the Army Cadet Program, I thank you for taking the time out of your busy personal schedules to administer and instruct the local program. While we know many of the challenges that you face, know that your dedication is appreciated and that the Army Cadet League of Canada is willing to assist. Army Cadets, I thank you for participating in Canada’s premier youth organization and for making an investment into yourselves. I also thank you for allowing us the opportunity to support you in your development towards adult hood. For those of you off to summer training, the National and Branch Directors and Officers hope to meet as many of you as possible, to personally thank you for your commitments to the Army Cadet Program. I wish everyone a fantastic, but more importantly, a safe summer. Captain Gilbert, first recipient of the ALCL’s President coin. 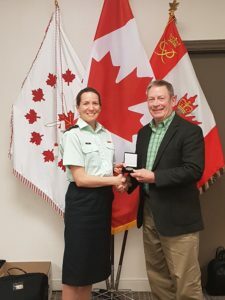 Mr. Bill Fletcher present the Hamilton Watch to cadet Nicole Michalewicz, 1705 British Columbia Dragoons (Vernon) Army Cadet Corps, BC, for her outstanding participation of the 2017 Army Cadet Voyage in History tour. From L to R: Mrs Ruby Brydges, National Treasurer, Mr. Harry McCabe, President, Ontario Branch, Mr Jean Lord, President, Québec Branch, Mrs. Cathy Bach, National Vice-President, Mr. Ivan Wawryk, Adviser on Northern Affairs, ACLC, and Mr. Fletcher, during the Gerard Buckley Cadet Fund presentation at the 2018 national AGM.